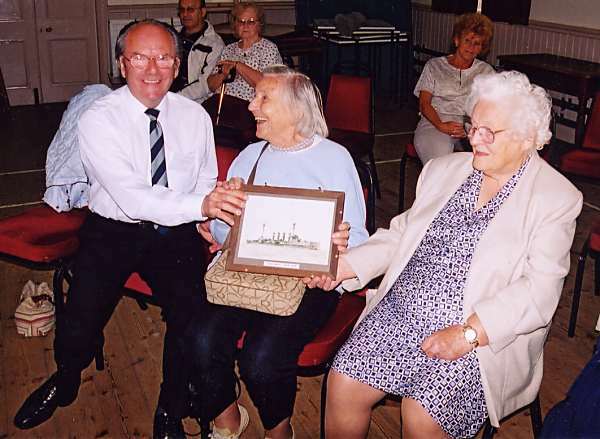 Clem Watson and Jean Newell with Diana Back, daughter of the captain of the Natal, which sank in the firth in 1915. Diana lost both her parents in the tragedy, as her mother was visiting at the time. This photo, and my presence in it, is pure coincidence. Miss Diana Back, daughter of the late Captain of HMS Natal, making her first visit to Cromarty since the loss of her parents, met Catriona Gilles while in the Natal section of the local Cemetry, and invited her to attend a lecture on George Ross(1700-86). This was one of the events for a Reunion of Finlaysons, Skinners & Hoggs. The visit of Miss Back, a wonderful lady in her late 90's, was a bonus to the occassion 13th Aug. 2003. Mr Eric Malcolm & friends then took her round to Invergordon to see the Natal Memorial, next to the RNLI Crew Room. Seeing Clem's picture on here reminds me of the days when he used to travel on the bus to Inverness to work every Monday morning. I was going to school at Fortrose Academy. I will be very interested to receive any more information relating to the names of those serving on the Natal and details of the proposed entertainment and fatal explosion (date and time and effort to rescue survivors). An uncle of mine was rescued. Don't know about names Primrose. But details about explosion etc. can be found in a book I have had from the Invergordon Library many years ago but they had it a short time ago. It is called "THEY CALLED IT ACCIDENT". It has all the official details of the enquiry - all 100% fact.